--and find the answers to all sorts of questions dealing with gardening, wildflowers, native plants, an occasional orchid (or two), your life style, and how to bring Nature's World (usually minus "tooth and claw") into your own back yard. My email is second from the top of the list at your left and again at the bottom of the page. Remember to email The Wild Gardener just send a note to thewildgardener@earthlink.net. "Remember, a paranoiac is simply a person in full possession of the facts"
"Anyone who has a library and a garden wants for nothing." Marcus Tullius Cicero. "Every breath is a guinea in the bank of health." Robert Morley in Truman Capote's script for Beat the Devil. "A narcissist is someone better looking than you are." Gore Vidal. "Since then the Moon has heard jackals cheeping in thyme deserts--" Arthur Rimbaud in "A Season in Hell." "A jay hasn't got any more principle than a Congressman. A jay will lie, a jay will steel, a jay will decieve, a jay will betray; and four times out of five, a jay will go back on his solomnest promise. The sacredness of an obligation is a thing which you can't cram into no bluejay's head." Mark Twain in his story "What Stumped the Bluejays." "He's not worth a sack of peatmoss!" said by orchid grower Ray Milland to Detective Columbo in the 1972 TV program entitled "The Greenhouse Jungle." "History celebrates the battlefields whereon we meet our death, but scorns to speak of the plowed fields whereby we thrive. It knows the names of the kings' bastards but cannot tell us the origin of wheat. This is the way of human folly." "I have to say that I am really angry at the moment. I have watched with increasing frustration my beloved hobby, my chosen way of life, the thing I love the most hijacked by what seems to me to be a gang of interior decorators and installation artists." Spring Is Stepping Out from the Wings--at Best Twisted! 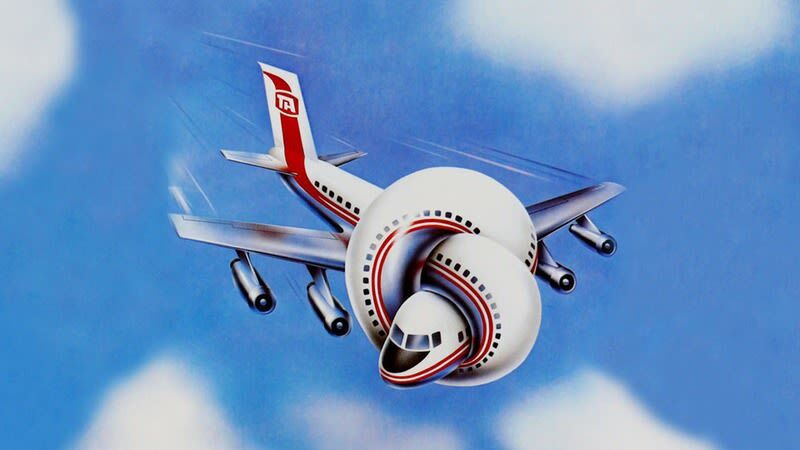 air liner featured in one of the funnier movies ever to fly thought the silver screen, simply called "Airplane." squill, their small but brilliantly-blue flowers dotting the emerging lawn like bits of colored tinsel. 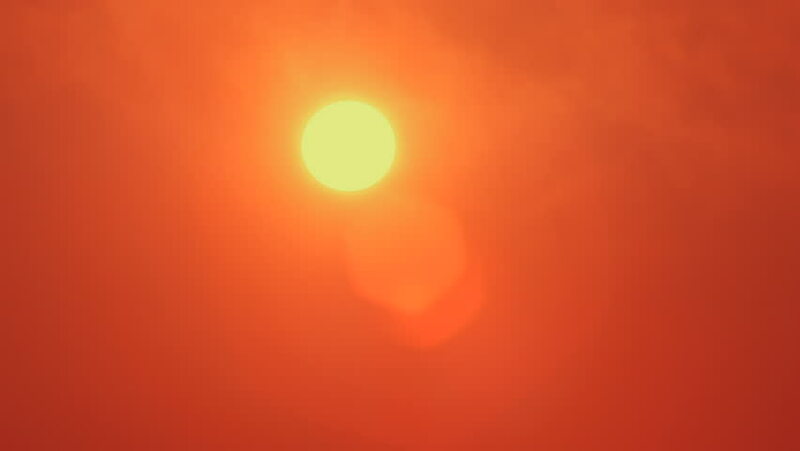 But in addition to the sun, you will notice when hit by the direct rays of the sun, there are hints of heat and as the days go by it will be hotter and hotter with local weather gurus predicting temperatures like 104 as summer enters the scene. Two New Books from the Wild Gardener are often for sale at Local Bookstores--and as of last week the new edition of "Loves Me--Loves Me Not!" will be available for sale at the local bookshops! I'm happy to be able to announce the publication of two new books from my studio, the first is a second edition of Solving Deer Problems, originally published in 2003, with black and white photos but this edition brightened with the use of over 100 color shots, many of fantastic plants that are generally shunned by deer and ready to grow with exuberence and brighten your garden world. The second book is titled Hydroponics for Houseplants and includes everything you ever needed to know when growing houseplants in water instead of soil. This book contains dozens of my pen and ink drawings of plants along with a number color photos of live plants doing great without a hint of soil in the neighborhood. And thanks to the good graces of Bella Rosa Books and its publisher, Rod Hunter, The Wild Gardener, that award-winning book that opened up American gardens to the wonderful world of native plants, is back in print. Selected as one of the 75 Great Garden Books by the American Horticultural Society and winner of the Garden Writers of America Art of Communication Award, this book is not only full of hort-knowledge but entertaining as well. In addition Mr. Hunter has also republished Thoreau's Garden and in addition now stocks that great children's book The Moonflower. In Asheville, the books should be found or ordered from Malaprop's downtown or at the bookstore of the NC Arboretum. The hydroponics book is available at the new Asheville store Fifth Season devoted to horticultural pursuits and located in the new Whole Foods Plaza, across from the Asheville Mall. That's one angry duck above getting ready to spout off, not about the turkeys visiting our neighborhood (see below) but the Turkeys who have invaded Raleigh and within a short time (politically speaking) have relegated North Caolina to the status of a state now flagging (and lagging) behind the rest of the Southeast--and that includes Florida! They live up to the collective moniker of being outrageous politicians with no thought to what tomorrow might bring to the state, especially in the line of great corporations ready to invest in a state that inches down in teacher pay, has disenfranchised an incredible number of honest folk, tried to issue passports for transgendered people having to use public lavatories, and dishonest folks who have cut taxes to the point of no return, and continue on their march to eventual demolition of the entire network of existing efforts at helping society get along! 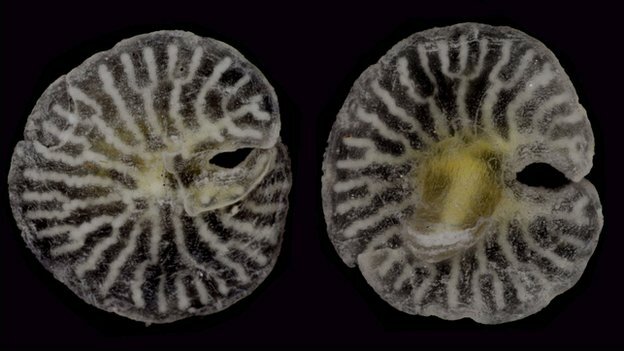 They recently appeared off the coast of Southeast Australia living at a depth of 400 to 1000 meters. Their resemblance to a mushroom is striking. They are multicellular and definitely nonsymmetrical in structure. "They defy all existing classifications of life," said researchers at the University of Copenhagen. To that end, they have been named as a new genus, Dendrogramma enigmatica. Photo is courtesy of the BBC. This beautiful and new passion flower came from Logee's last spring and it decided to bloom this Labor Day weekend, not only with stunning flowers but a parcel of buds, each looking like small, pink balloons. The vine bears eight to twelve bright pink flowers up to five inches in width. The genus was first found in Brazil, then toured the world taking a fairly long time in the transist, but today,just about every purveyor of tropicals has 'Pink' in their catalogs. It's a wonder just how fast a new cultivar can travel! Across America as the amount of open but uncultivated or un-invaded land continues to shrink, and the deer (and, in general, the critter population) continues to grow in numbers, it's getting succeedingly more difficult to garden, not only in the suburbs, but in the burgeoning city and far out into the wild. 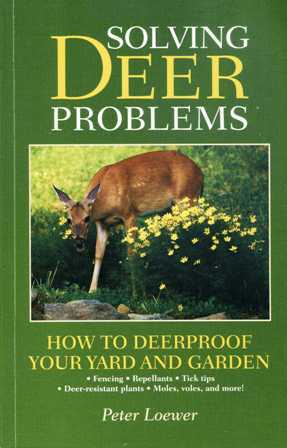 So more and more gardeners are looking for plants that deer might pass over or ignore completely. And please remember that when a deer is hungry, with the hunger bordering on starvation there is very little that they will not attempt to ingest. 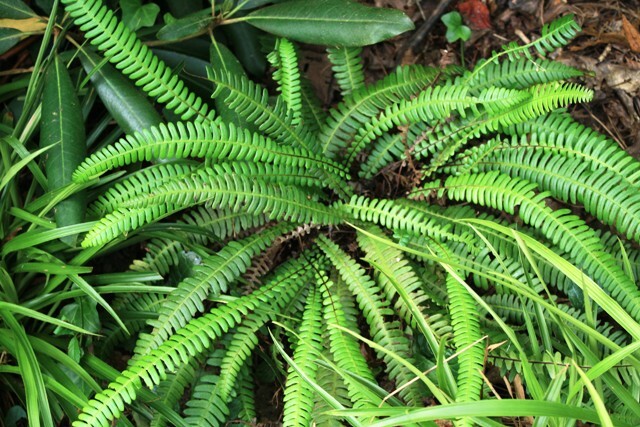 Deer fern (Blechnum spicant)is a native plant originally from the Northwest with fronds about twenty inches tall, requiring little maintenance, but preferring consistent soil moisture. These ferns also prefer full shade, especially in the Southeast. They are hardy in USDA Zone 5 to 8. And as the picture shows they should be welcome in any garden! Many years ago while wandering a book store located in The Lower East Side, not far from Kamenstein's Hardware Store, I bought a book of poems by Oliver Wendell Holmes-- a good friend of Ralph Waldo Emerson, and therein I found his poem dedicated to the chambered nautilus, a member of the great mollusk clan that has as its domicile a spiral-shaped shell that is divided into a series of rooms or chambers beginning at the heart of the spiral. Then as season follows season and the creature within grows, the chambers expand their size and the inhabitant must move on up to a new room at each passing year. The term nautilus is from the Greek word for a sailor, so named because the mollusk is a sailor on the open seas and the shell his sailing ship in which it sails. 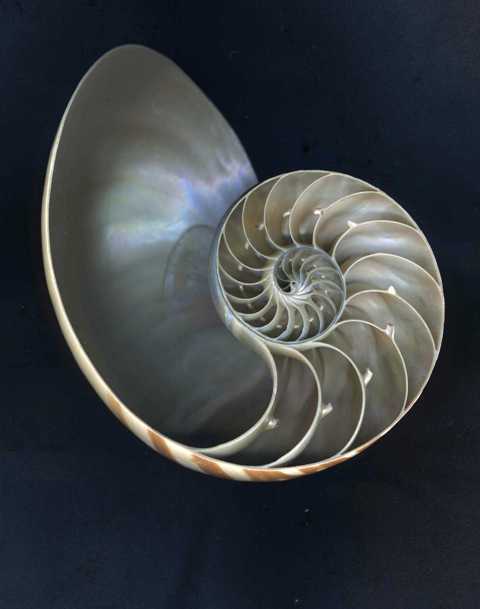 In the first stanza of the poem, a man who walks the shore finds the discarded shell of a chambered nautilus and he imagines this creatures life at sea. He left the past year's dwelling, for the new--"
Here's a great mushroom for the fall, known as the Jack-O-Lantern because the gills actually glow in the dark. In fact, in an unlit closet, these beauties of the night actually produce enough wattage that if held close to a newspaper, you can read the small type-- although it has a greenish-blue tint. 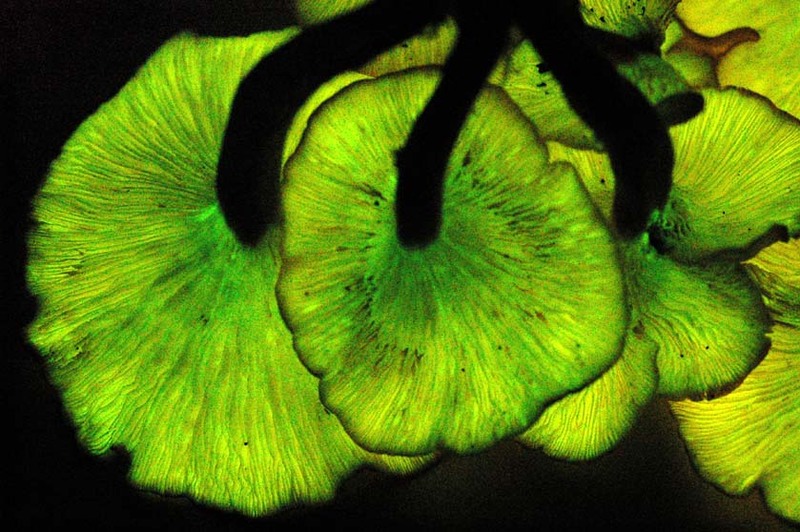 The inset photo is from a French mushroom site and shows just how they can glow! Look for this clumping mushroom at the base of oak trees not only in the forest but on suburban lots. 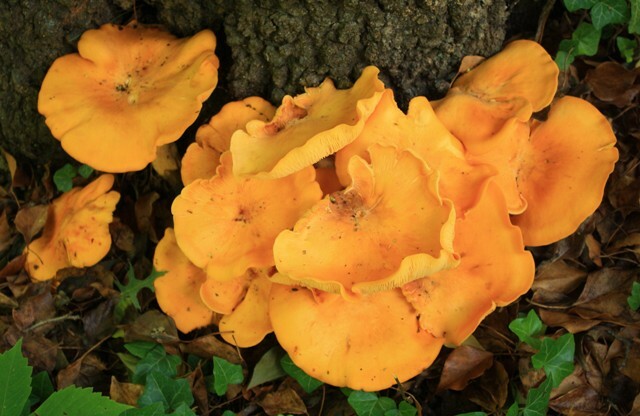 A similar, but phylogenetically distinct species is found in Europe but over here ours is known as Omphalotus illudens.While not completely poisonous, this particular mushroom can be misread because it resembles a popular eating variety known as a chanterelle, but these "Jacks" contain the toxin illudin and they are poisonous enough to lead to severe cramps and possibly a trip to the hospital. Any Film Noir buffs might recognize the poison illudin as the one that led to the death of the hero in that great thriller, D.O.A.. 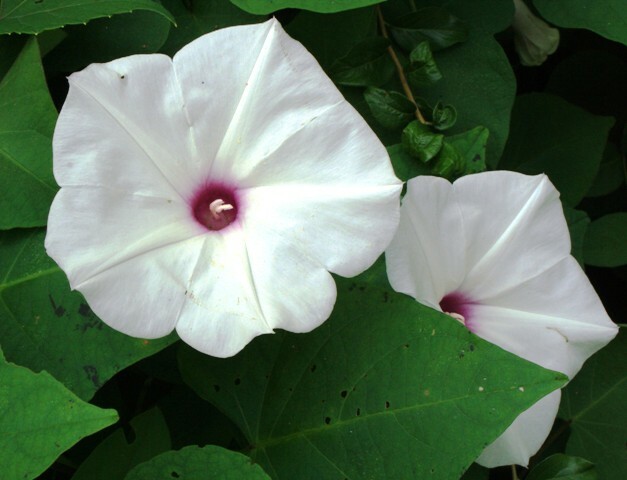 The manroot or wild potato vine (Ipomoea pandurata) is a rambling perennial vine that can grow to fifteen feet in a season, producing large white funnel-form flowers with purple centers, the flowers usually about three inches wide. Even though each bud is open for only a day, there are many buds on those stems, and you will have flowers for weeks at a time. The vines spring up from a very large tuber that resembles a cultivated sweet potato and American Indians used these tubers to make a poultice for treating rheumatism, and also for a laxative. So be advised to leave healing qualities to those who know and allow this vine for flowers only. 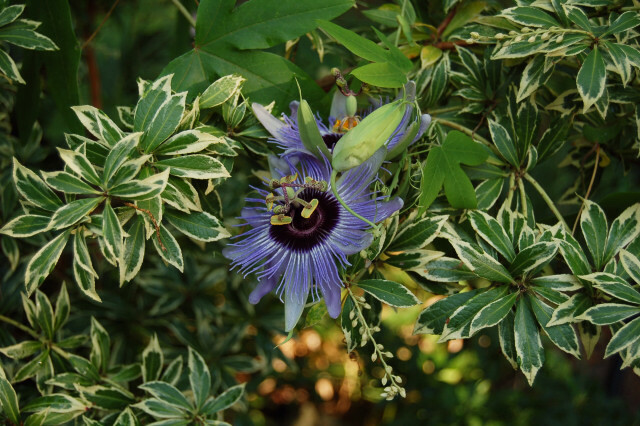 Give a rousing welcome to a great new Passion flower hybrid, a cultivar known as ‘Fata Confetto’, and a flower that is sure to be welcome in your backyard in a pot, or in warmer parts of North Carolina, planted out in the garden proper, only asking for a wire, string, or spare branch to grow upon. This free-blooming hybrid will produce a year-round show of fragrant, three to four inch lavender blooms with decorative and striped, frilly corollas. Banded in lavender and white, the crinkled filaments engulf each flower including a pleasant fragrance to add to the total package of floral beauty. 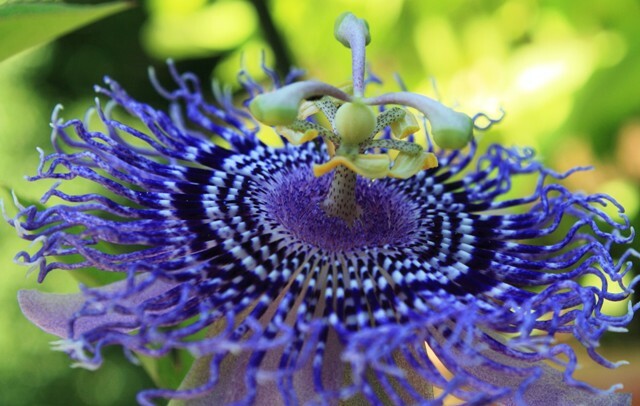 The parent of this beauty is our native Passion flower (Passaflora incarnata) and is said to be hardty to USDA Zone 8 with some protection. 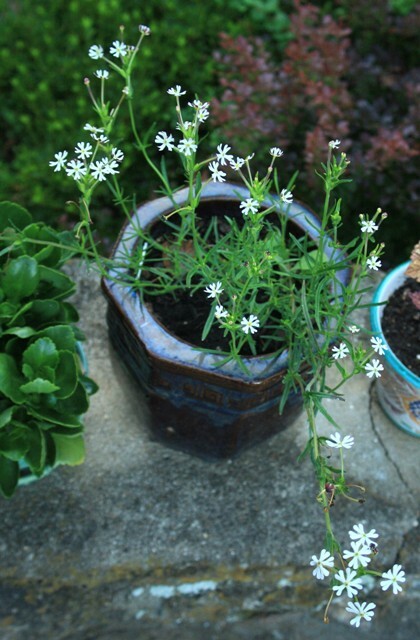 But if unsure, grow it in a pot and bring into the greenhouse or anyplace above freezing for the winter. 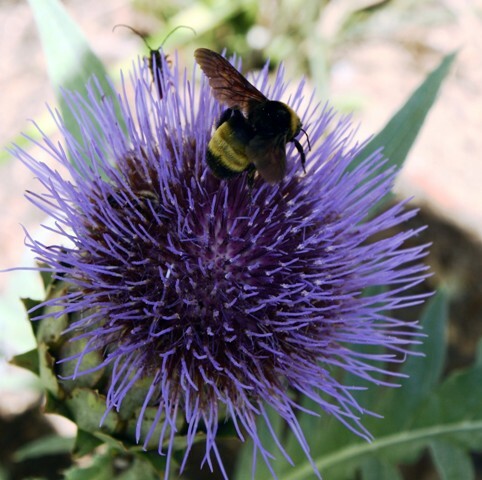 When in active growth this particular cultivar never stops blooming or rests like our hardy native that is known as the Maypop and is pollinated by, among others, carpenter bees. The night phlox (Zaluzianskya capensis), is a half-hardy annual from South Africa named in honor of Adam Zaluziansky von Zaluzian (1558-1613), a physician from Prague and author of Methodus Hervariae in 1592. 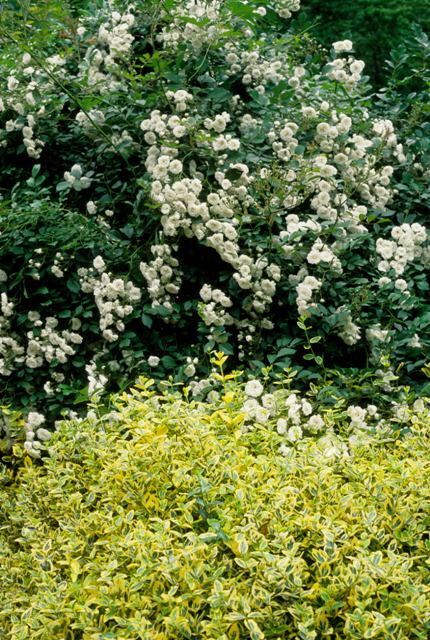 These beautifully fragrant, night-blooming flowers belong in every garden border or planted along the edge of a wall. There the gardener can not only smell the fragrance but will easily see the clusters of pretty but small phloxlike flowers. 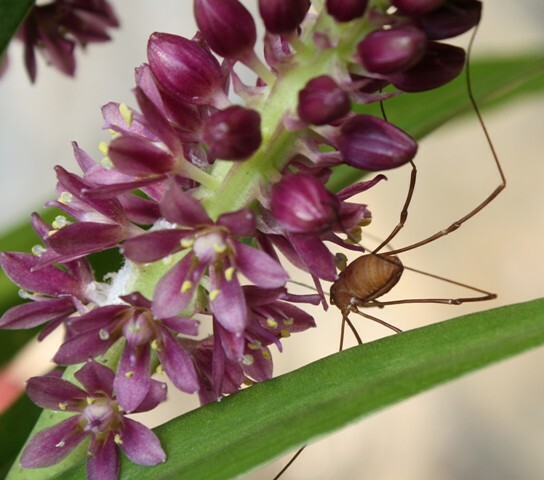 Each blossom is about a half-inch wide and the five white petals are notched at the tip--like the campions and catchflies--and when closed,m both the petals and the ouside of the floral tube are a satiny maroon with just a hint of white showing where the petals overlap. 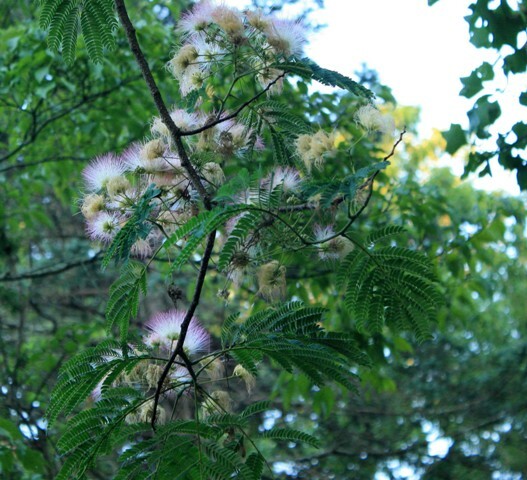 Albizia julibrissin is commonly called the mimosa, silk tree, or silky acacia. This hardy tree talked about as a great ornamental because of the fragrant and showy flowers. Trees seed with incredible abandon and if cut, quickly resprout from the severed trunk. Mimosas can reach a height twenty to forty feet and easily grow up to three feet in a typical summer season. The thin, light bark is nearly smooth. 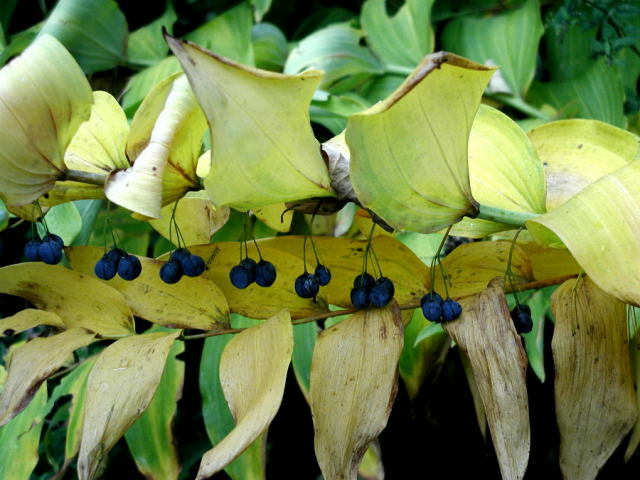 Deciduous leaves are feathery and fernlike and known as being bipinnately compound with ten to twenty-five pinnae per leaf and forty to sixty leaflets per pinnae. The flowers are very showy arranged in massed floral bunches (paniculate) at the ends of branches. They are composed of fifteen to twenty-five sessile flowers with numerous, conspicous stamens with a strong and sweet fragrance, especially at night. They bloom from May to August. Unfortunately, with all the beauty going for them, these mimosas are thugs. They take advantage of disturbed areas, and the seeds falling where they may, usually sprout and soon you have a forest of trees that force out most native species. Trees prefer full sun and are often seen along roadsides throughout the Southeast. My cardoon is blooming early, an unusual event at the plant is only two-feet high. But the blossom quite resembles one of the sky fireworks expected to fly over the city of Asheville tonight in celebration of the Fourth of July. Cardoons are marvelous plants for a special spot in the center of a garden bed or used for their silver-gray leaves alone at the edge of a stunning border. 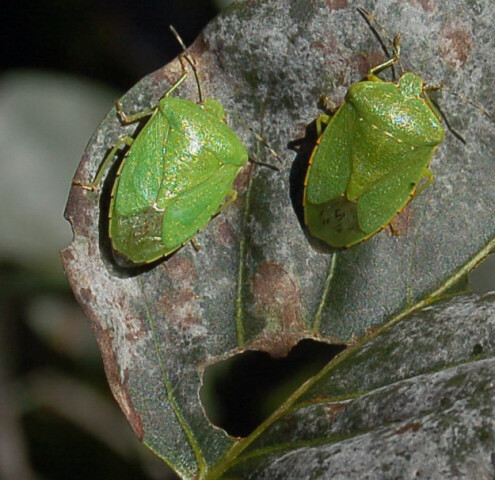 The photo above shows two recent imports from the wonderful world of bugs--green stink bugs-- who are taking advantage of a rip in a leaf, becomming a face looking out on the world with a look of surprise. The green stink bug (Acrosternum hilare feeds on native or ornamental plants with the preferred hosts being wild plants. They are a flattened, shield-shaped bug named for the absolutely foul odor that they produce when flattened with a swatter or rolled-up newspaper. Adults are bright green and about two-thirds of an inch long. Avoid them whenever possible and never vacuum them up to save time and effort! 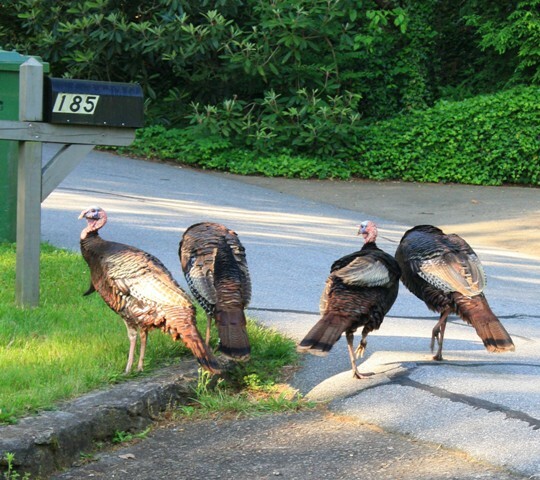 Since early spring our neighborhood in Kenilworth has enjoyed a visitation of six healthy and quite beautiful turkey hens, who wander as a group all over the woods and backyards of this great section of Asheville. Friday morning last (May 31) four of the grand dames chose to have a gobblefest in my driveway. With cajoling on my part, they moved on down the road so I could exit for a fast trip to the post office. "The Wild Gardener" Is Back on the Air--TWICE! That's cyber-air but air none-the-less. Once a week I'm again voicing my hort-thoughts on Asheville-Fm and all you have to do is click the link The Wild Gardener and the voice and the thoughts are there, if you know how to listen to radio from your computer. 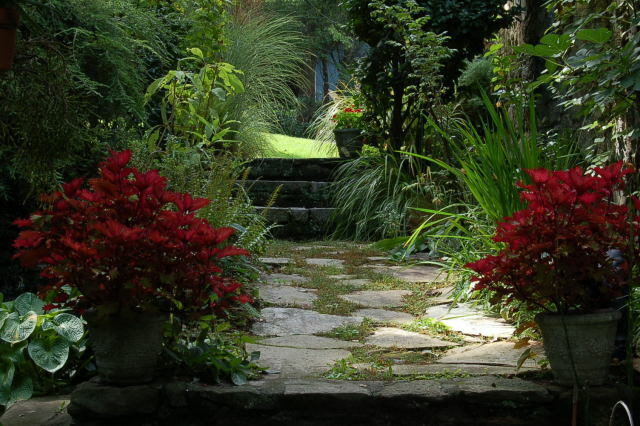 Then once-a-month our old program, Back to the Garden is returning to MAIN-FM at 103.7 the first Thursday of every month uniting Alison Arnold, Patryk Battle, and Your's Truly for hort-thoughts from around WNC and the state, and sometimes the world! Had a great time on Saturday morning visiting Lichtenfelt's Nurseries over in Greer South Carolina, not too far from a well-attended soccer match on a beautiful, but chilly morning. I was introduced to a number of my garden friends by Jani, the talented and gracious horticulturist who is the chief factotum at this marvelous nursery. 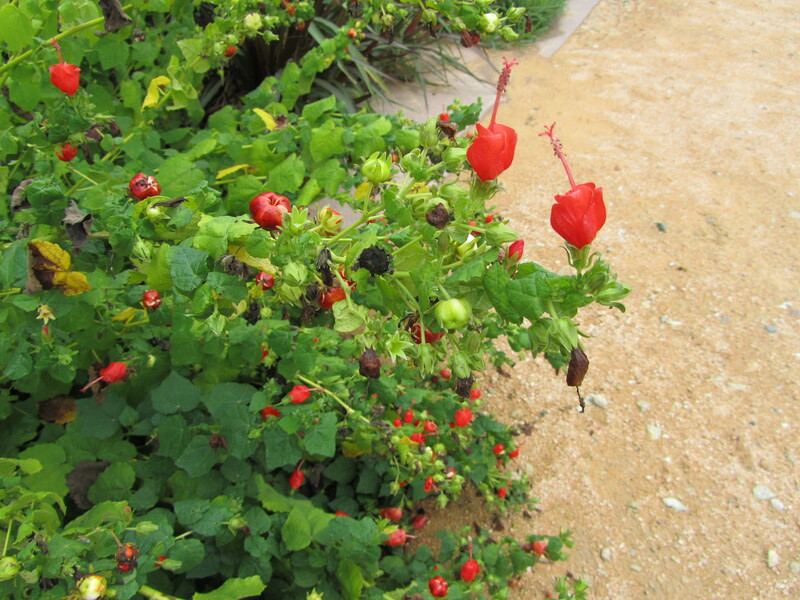 A plant question arose about a shrub called the Turk's-Cap Bush. Turns out it bears during most of the garden season, bright red flowers that resemble the hats worn by Turkish men during odd moments of that country's history. 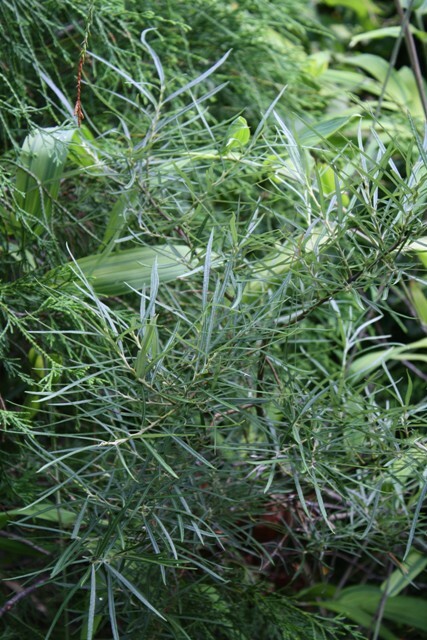 It's botanically known as Malvaviscus penduliflorus and is known to be hardy through most of USDA Zone 7. Ladies, I did my homework! The photo above was provided by a garden writer friend of mine, Cheryl Kearns, who snapped this shot at the JC Raulston Arboretum over in Raleigh. 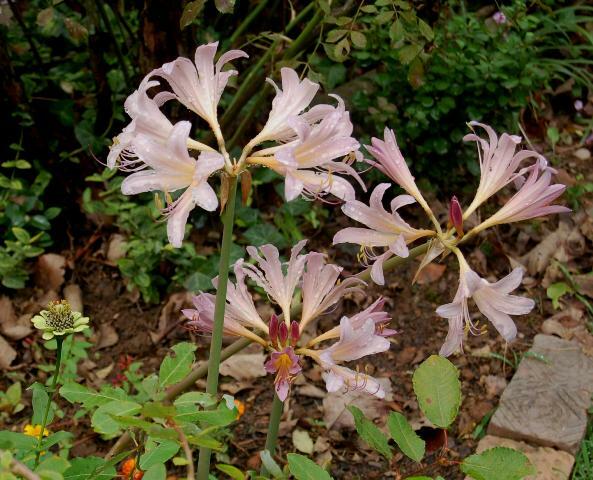 The Naked Ladies Are a Bit Early! 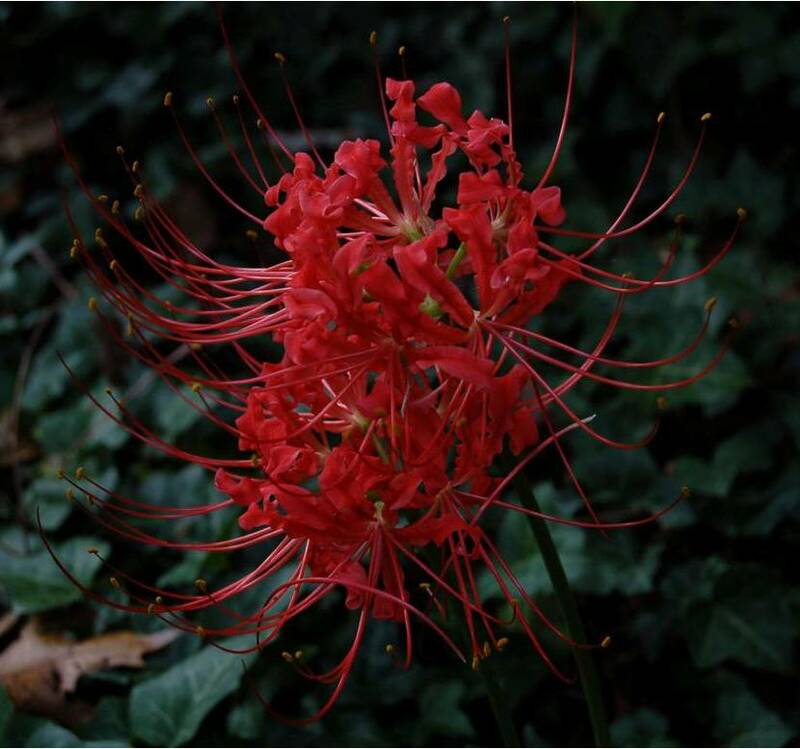 Their scientific name is Lycoris and their leaves appear--without flowers--in early spring and then in about a month, the leaves vanish and nothing more is seen until, suddenly, usually in mid-September the blossoms appear on stems naked of leaves, hence on common name. This year just in time for the first major hurricane (they're also called hurricane lilies in the South) the complex and quite beautful red flowers appear on foot-high stems. The Cut-Leaf Forsythia Blooms Out-of-Season! 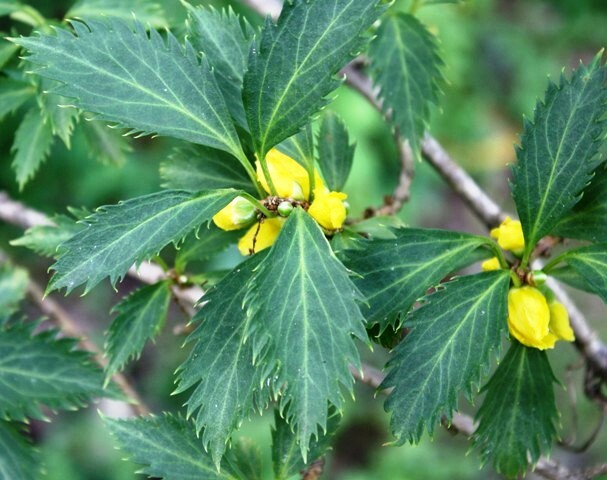 The cut-leaf forsythia is, like all forsythias, hardy up to USDAZone 5. It's ultimate height is eight feet and it spreads out about six feet with an upright oval to rounded shape. The unique quality of this particular cultivar, known as Forsythia x intermedia 'Tremonia', refers to the most unusual handsome dark green foliage that is deeply cut (in the trade it's serrate) making it a standout in the garden when it's not in bloom--but when it is, this is a stellar plant. Unfortunately, due to the strange summer we've had, this shrub now believes it's autumn and is in full spring bloom. Early Monday morning of August 20, I was about to plant a great blue lobelia (Lobelia syphiliticus) out in the new meadow garden when I noticed that a carpenter bee was sound asleep wrapped in the beautiful blue petals of this fascinating wildflower. So I let him snooze until the morning sun touched the plant and the bee woke up to a new day. Back in the 1700s it was believed that a drug made from this plant would cure syphilis but, unfortunately, for the New World and the Old World, it didn't work. 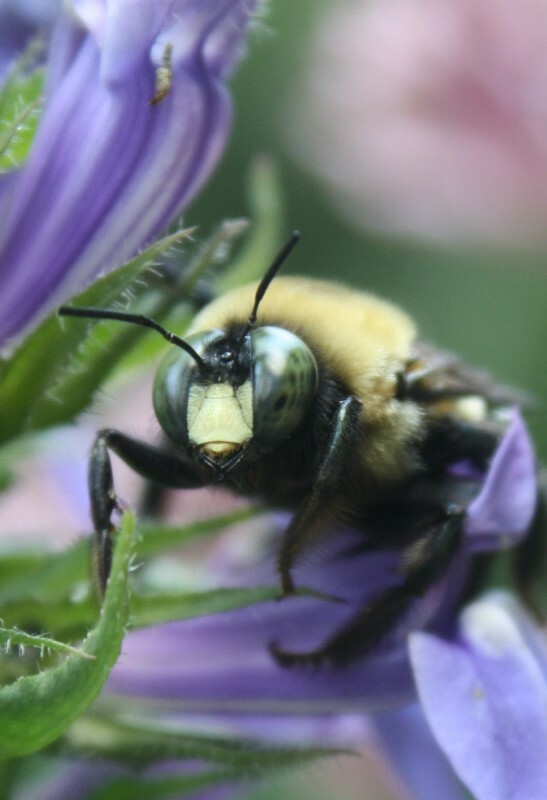 Carpenter bees are almost identical to bumble bees, the difference being that the body of the carpenter is black and the body of the bumble is black striped with yellow. Both make honey. 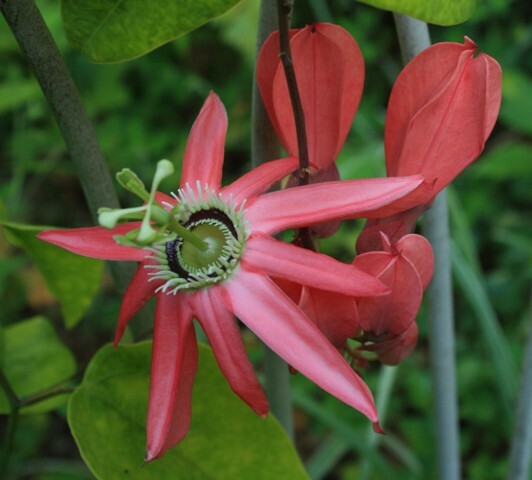 The scientific name is Passiflora and there are dozens of species throughout the warmer parts of the world ranging from the jungles of Rangoon to the mountains of North Carolina. Their floral structure is complex and in the Christian Church the many parts from the coiled tendrils to the central structures represent the Passion of Christ. Their scientific name is Terrapene carolina carolina and it's our only turtle species that can enclose their bodies completely in their elegant hinged shells. We have a garden not far from a lake best described as an open woodland and these land turtles have a home range of about 250 yards so the turtle above continues to roam while searching for berries, funguses, and fruit; they abandon the carvierous live style upon reaching adulthood. 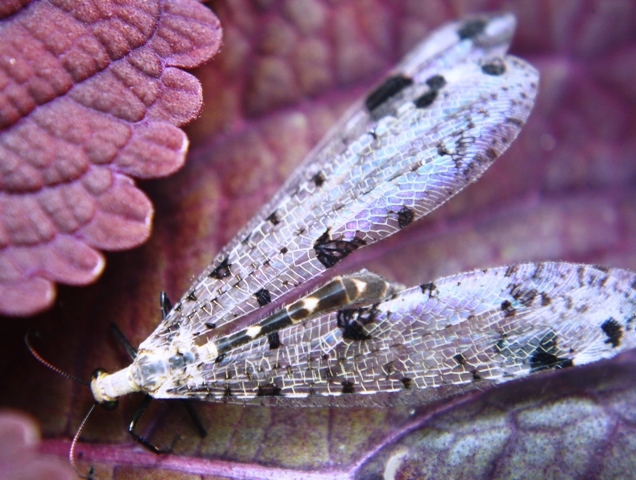 Lacewings usually fly at night aiming for lights. They are often found in gardens tht are located near water and at the edges of a forest or large grove of trees. Little is known of their food preferences and even less about life cycles. They are found from Nova Scotia down to the mountains of North Carolina. 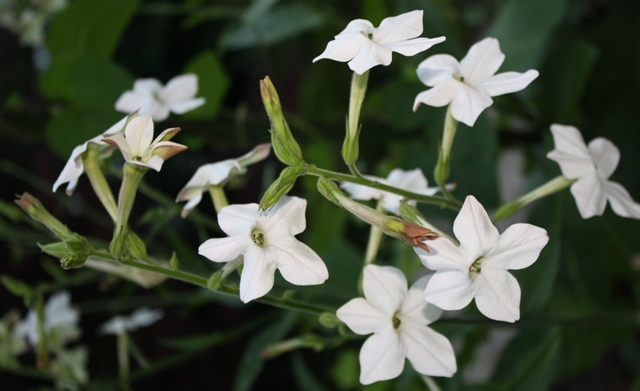 Actually a tropical perennial that blooms the first year from seed, the woodland tobacco (Nicotiana sylvestris) is native to the Argentine and usually used as an annual in northern gardens. Reaching a height of four to six feet, the tubular flowers are pure white on the inside and on the outside beatufiul pastel shades of green and tan while waiting to open. The sweet scent will undo many misfortunes of the day. They close in late morning to open again in late afternoon. 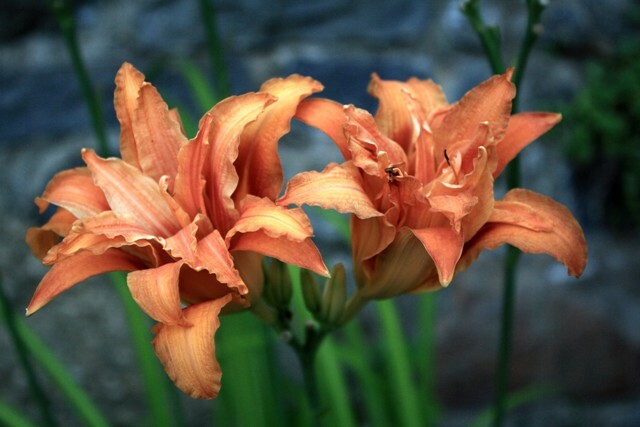 Originally blooming in Eastern Asia and carried along the Old Silk Road by carts, wagons, and feet, the tawny daylily eventually made the journey to the fields and roadsides of America. During most of the 1900's daylily hybridizers have delighted in breeding tetraploid plants, plants that tend to have sturdier sepals and petals with many color traits not found in diploids. Until this time nearly all daylilies were diploid. Called "Tets," by breeders these plants have 44 chromosomes, while triploids have 33 chromosomes and diploids have 22 chromosomes per individual. Hemerocallis fulva 'Europa', H. fulva 'Kwanso', and H. fulva 'Flore Pleno' usually do not produce seeds and reproduce with underground runners. A polymerous daylily flower has more than three sepals and more than three petals. Some gardeners link "polymerous" with "double," many polymerous flowers have over five times the normal number of petals. The other morning I found a new (at least to me) ladybug on the leaves of a big geranium out in the side garden. 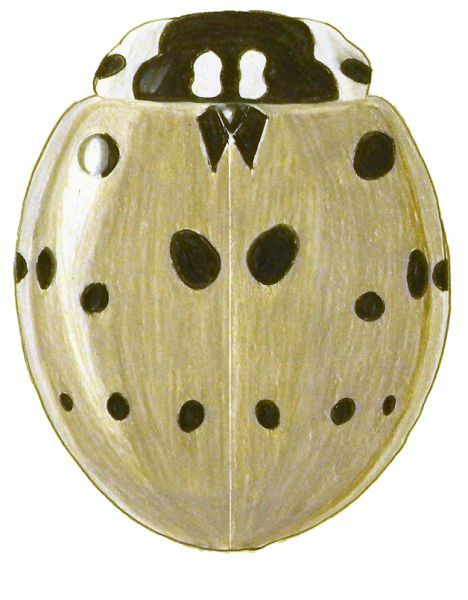 It's known as the 15-Spot Black and White Ladybug, and it's as cute as a ladybug usually is. This is a native species usually limited to the eastern part of the USA. Each wing-cap (elytron) has seven spots: one near the shoulder, a row of three near the middle, and another row of three to the rear. At the top of the wing-caps is the beetle's fifteenth spot, which is divided between the two caps. It's in the news again! Another hotel threatens an area right in the middle of Asheville's downtown, the home of the Basilica of St. Lawrence (1909). Designed and built by Rafael Guastavino Sr., this magnificent structure is a salute to the entire spirit of humankind and the master's last project completed in his lifetime. It's one of only two churches built worldwide where Guastavino Sr. served as the primary architect. 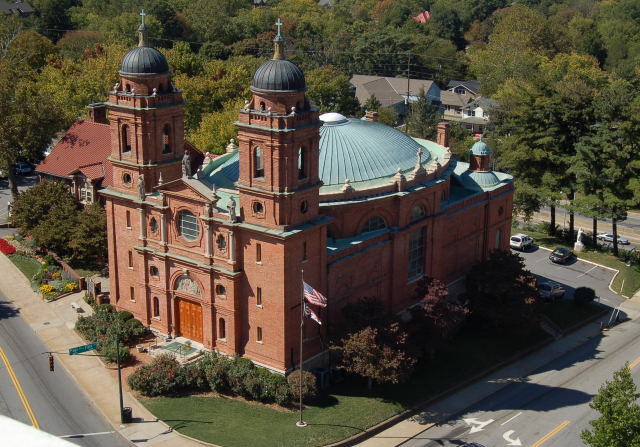 And please grant the City of Asheville the wisdom necessary to provide the gracious and dignified surroundings necessary for such a great ediface by supporting the church in its efforts to control development in the line of sight surrounding the church's property. I took this photo in the early morning light of last Sunday (09-18-11) before the night owls nodded off or the morning paper was delivered. 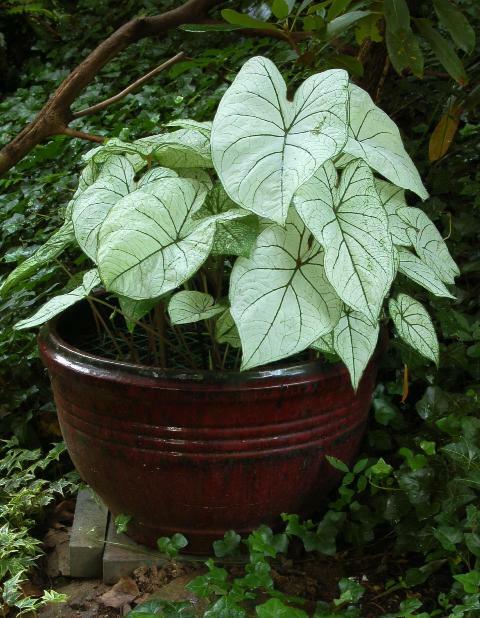 A member of the great morning glory tribe, this particular tropical plant (Ipomea alba) begins to bloom in mid-July and continues to charm the gardener until just before frost cuts it back to the earth below. But there are always seedpods left behind to provide flowers for the next summer season. These fantastic flowers are fragrant, too! Last year, during the first week of August, the mature English ivy (Hedera helix) growing on the very old white oak that shades the path leading down to the larger of our gardens, began to bloom. The flowers are small with tiny yellow petals, are deeply fragrant (mostly like rich honey) and full of honey bees in search of nectar. Note the leaves are more like a goose-foot rather than traditional ivy but that's what happens when ivy reaches maturity (30 to 45 years) and changes from an climbing vine to an aboreal shrub. 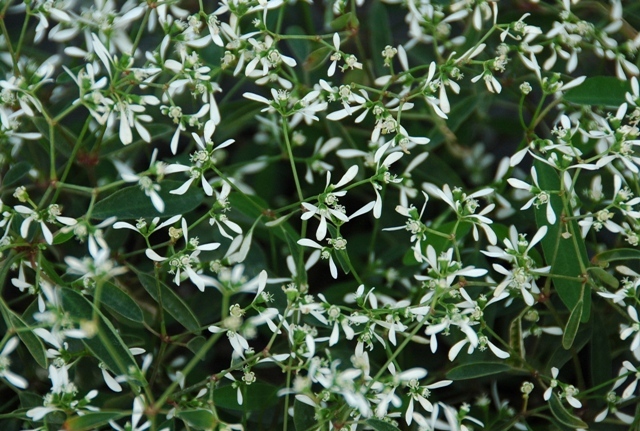 This is a beautiful shrub that is perfect size for smaller Asheville gardens. The current scientific name is Salix eleagnos angustifolia but I still prefer the original name of Salix rosmarinifolia. Usually never topping ten feet this plant is perfect as a hedge or as a great pot plant, easily surviving our winters as long as the pot is an adequate size. 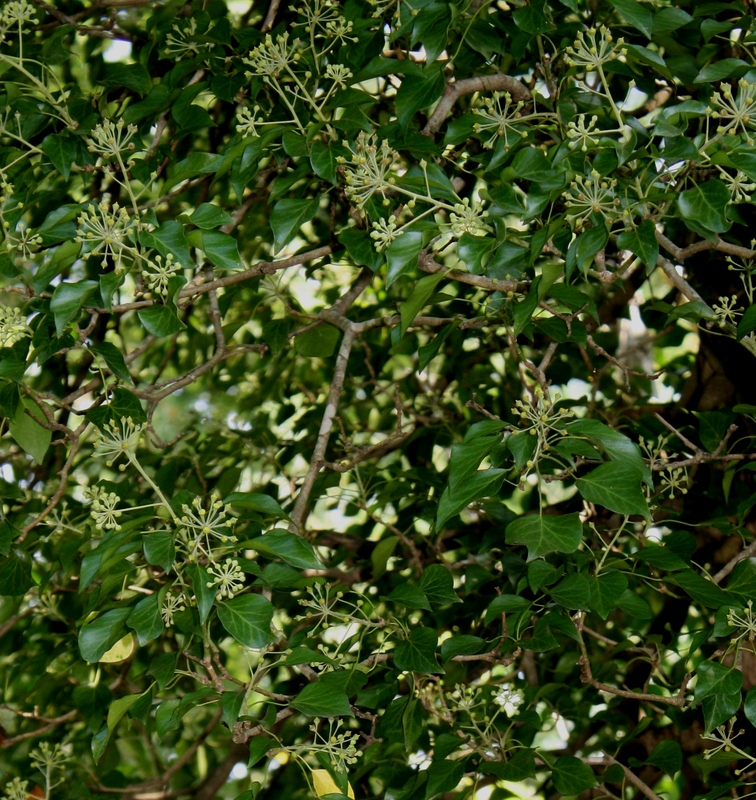 The present such shrub came from a cutting offered by my old garden friend from the Brooklyn Botanic Garden, Budd Myers. When summer winds blow (certainly not now), some tropicals just get to looking better because they, like most of us, enjoy bright light but cooler temperatures. Here caladiums revel in morning sun. Fleabanes are charming wildflowers that if they were rare, everybody would want them in the garden. But because they are found in virtually every state on the continent they are not rare and their praises must continue to be sung by only wildflower lovers. 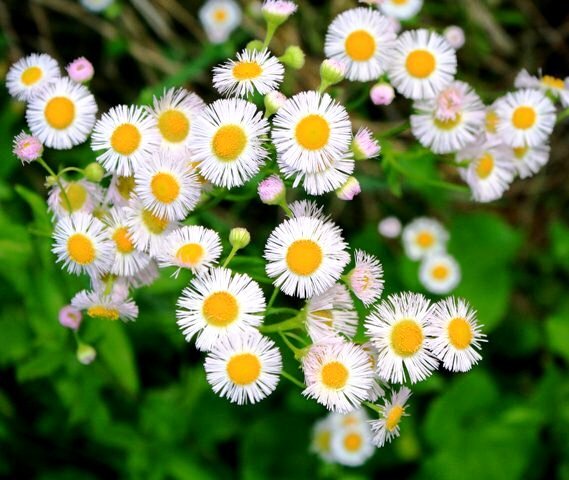 The scientific name of the common fleabane is Erigeron philadelphius. Back in the early days of America it was a common belief that dried fleabane flowers and leaves could be placed in bedding, clothing, and even pockets to keep fleas at bay. As a flea-fighter, such weapons do not work. If they did there would be few, if any, fleas in the USA. Morris Graves (1910-2001) remains today one of the more interesting of American artists, a man who devoted most of his life to extolling the wonders and beauties of nature. In 1932 after graduating from high school he settled in Beaumont, Texas but soon returned to the Northwest living around Seattle. His early work featured oils and often touched on birds, especially birds that were metaphysical orphans of the storm. 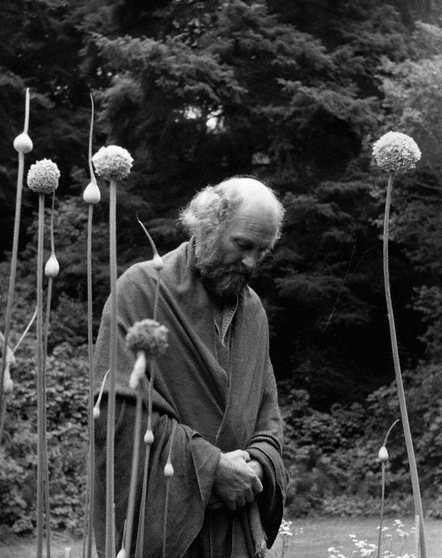 In the early 30s he bagan to study Zen Buddhism and in 1934 built a small studio in Edmonds, Washington that soon burned to the ground and included all his works to date. In 1940, Graves began building a new house, which he named The Rock, on Fidalgo Island. He lived at The Rock with a succession of cats and dogs, all called Edith, in honor of poet Edith Sitwell. 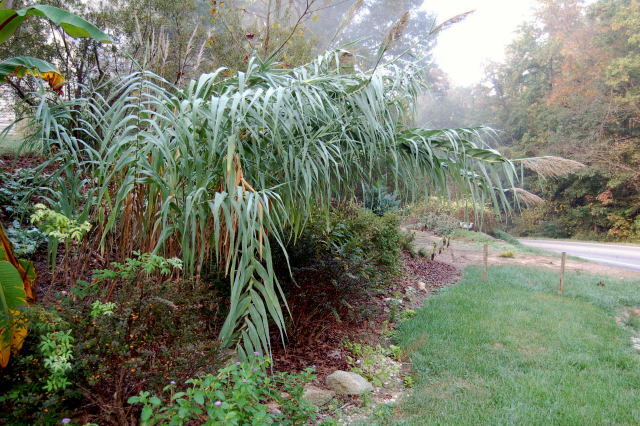 The following pictures (except for the Arundo donax, photographed in a Wake Forest garden) were taken in my garden during the late spring, summer, and early fall of two years ago. 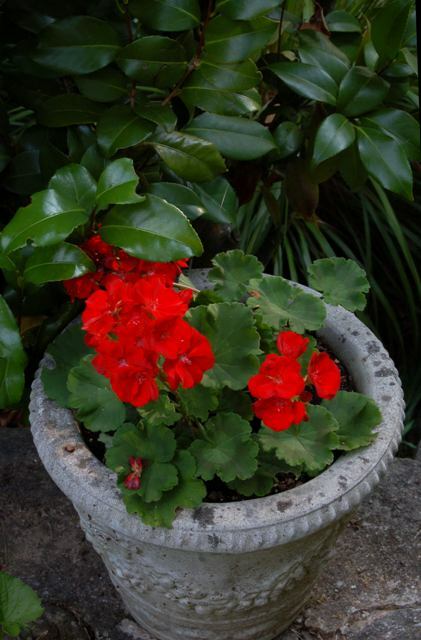 I call them tough plants because they are growing in garden clay laced with shredded leaves and if in pots, bagged potting soil that is fertilized two or three times during the growing season. Some months ago I promised to run the old column on what you can grow in the vicinity of walnuts. Walnuts, as most gardeners know, produce a poison known as juglans, a chemical that attracts a number of other plants causing them to languish, then slowly fade away. 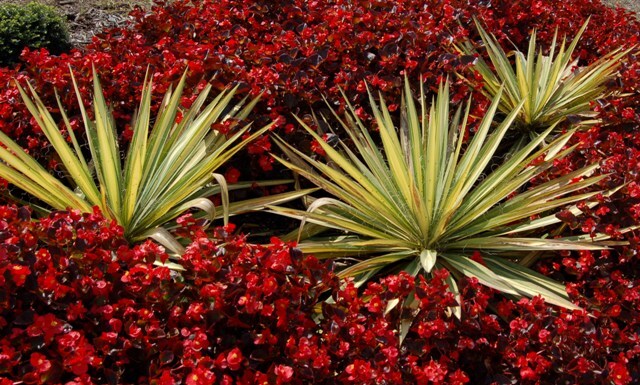 But there are a number of plants that appear to be immune. Read the Walnut Tolerant Plants List Here. 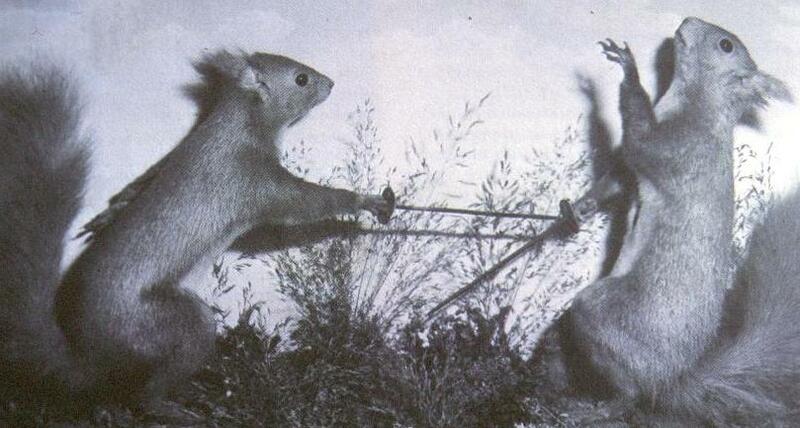 And let's not forget the squirrels of Asheville, rather entaining but by some considered trouble-makers, as they spend their fun-filled days in eating birdseed, chewing off high branches of oak trees, and using the tactics of jewel thieves in Topkapi when finding that birdseed. Look below and hear that tap of clashing sabers. Listen! You can almost hear the memorable score of Manos Hadjidakis as these furry critters play at fencing (courtesy of a Victorian stuffed-animal display in a small antique shop just down the road from Sissinghurst). Remember the world of strange flowers-- There are a number of very, very strange flowers living in the world today, having nothing to do with prehistoric times. One belongs to a group of tropical plants with blooms referred to as peilican flowers or calico flowers. 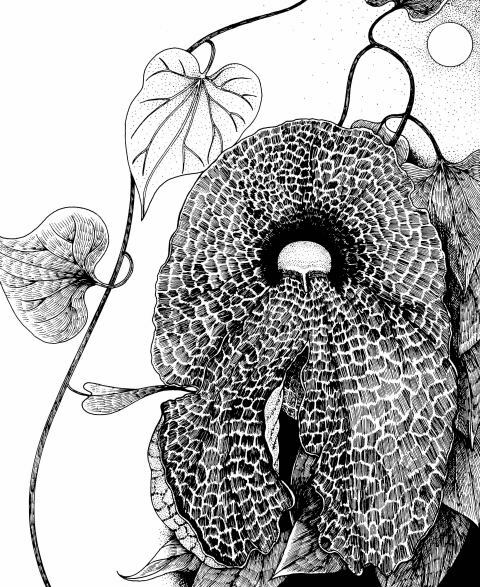 The most bizarre is the pelican flower, Aristolochia gigantea, which first arrived in England being shipped from Guatemala in 1841. This is a high-reaching vine that can reach up ten feet, and bears flat, smooth, heart-shaped leaves that have a slightly rank odor when crushed. 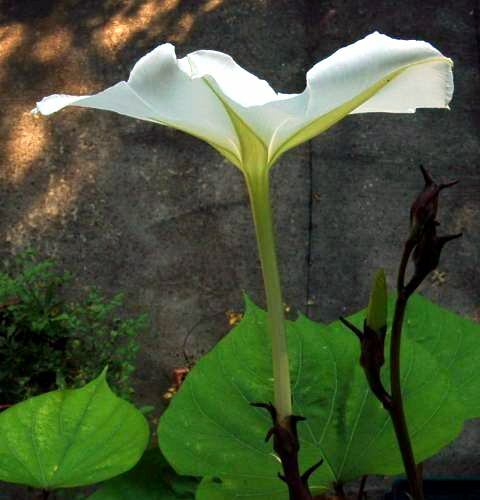 The six-inch flowers are off-white, veined with purple, and sit on top of a U-shaped tube of a greenish color and also with an unattractive odor. Best as a flower for the evening garden, this is a showstopper. 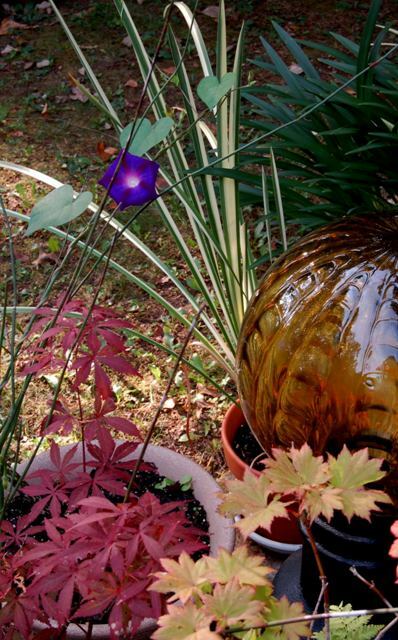 The vines do best in pots that hang on wires, allowing plenty of room for growth. They can also be carefully unwound from one wire and rewound on another but remember to maintain the counterclockwise turns. 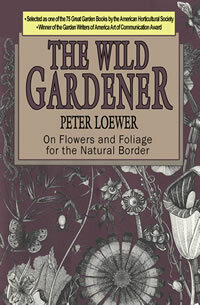 Peter Loewer: The Wild Gardener, Asheville, NC. My email addy--as they say in our sister country of Austrailia--is thewildgardener@earthlink.net! All contents of this site are Copyright©Peter Loewer, All Rights Reserved.